Cranberries prevent platelet build-up and lower blood pressure reducing the risk of cardiovascular disease. They can slow tumor growth in the following types of cancer: ovarian, breast, liver, prostate, colon. They can also improve your dental health by stopping bacteria from sticking to your teeth and improving gum health thanks to its anti-inflammatory properties. Cranberries are also widely used to cure and prevent UTIs (urinary tract infections). The proanthocyanidins stop bacteria from attaching to the walls of the urinary tract and reducing inflammation. But can cranberries treat a yeast infection? There isn’t as much research about the antifungal properties of cranberries as there’s about aloe vera or honey, and none of the studies focus specifically on vaginal yeast infections. In one study crude extracts of cranberry were used to check how they affect different Candida species. The researchers found out that cranberry extract is especially effective in preventing Candida glabrata from sticking to surfaces and damaging Candida albicans protective membranes called biofilm. Another study used artificial urine to see how cranberries can help cure urine yeast infection. The study shows that the proanthocyanidins found in cranberries prevent the formation of biofilms in Candida albicans and interfere with its adherence abilities. A study focusing on oral yeast infection found that cranberry proanthocyanidins reduce the inflammation caused by Candida species, by damaging their biofilms and adhesion ability, so cranberry should be further investigated to come up with new treatments for oral candidiasis. Although there’s no research available about how cranberries can help fight vaginal yeast infections, there’s a lot of evidence of its strong antifungal qualities. So drinking cranberry juice, eating cranberries or taking cranberry based supplements may be very effective to prevent Candida infections or support antifungal treatment. Also, it’s worth to include other foods containing proanthocyanidins, such as blackcurrants and grapes, in your diet. So how can you make the most of cranberries? Incorporate cranberries into your daily diet by adding them to your smoothies, yogurt and morning oatmeal. It’s got a high concentration of cranberry extract (50:1 ratio), the equivalent of 4200 mg of fresh cranberries per pill. It’s the highest concentration I found on the market. Apart from its antifungal qualities, it’ll help you maintain healthy urinary tract, prevent and treat UTI. Remember that cranberry supplements could interact with some blood thinning medication, antibiotics, aspirin and liver medication. For more variety, try other proanthocyanidin-rich foods, such as grapes, apples, red wine, blueberries, black chokeberries, bilberries, black currants, hazelnuts, pecan nuts, and pistachios. 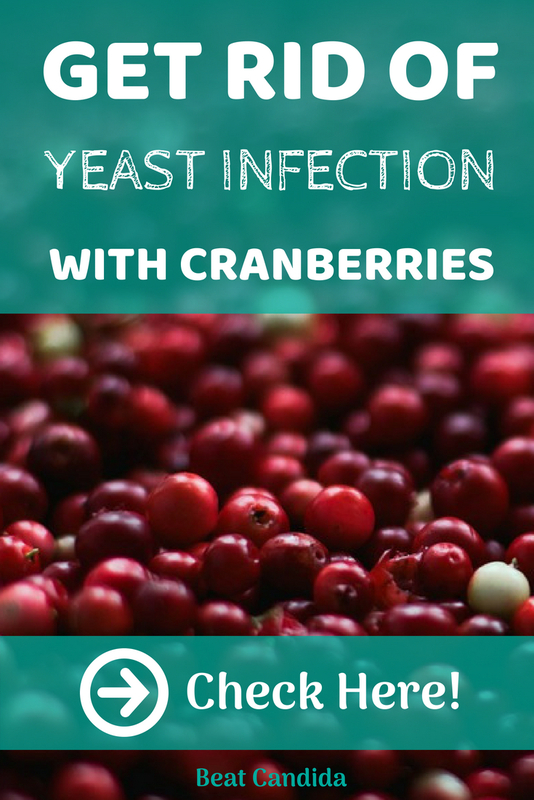 The antifungal and immunity boosting qualities of cranberries make them one of the most effective natural remedies for vaginal yeast infections, and the fact that apart from interacting with some medication they virtually don’t cause any side effects makes them one of the safest as well. By incorporating them into your diet you can help prevent yeast infections or use them as a supplement of your antifungal treatment when you’re suffering from a vaginal yeast infection. Make sure you’ve always got a supply of cranberries on hand! 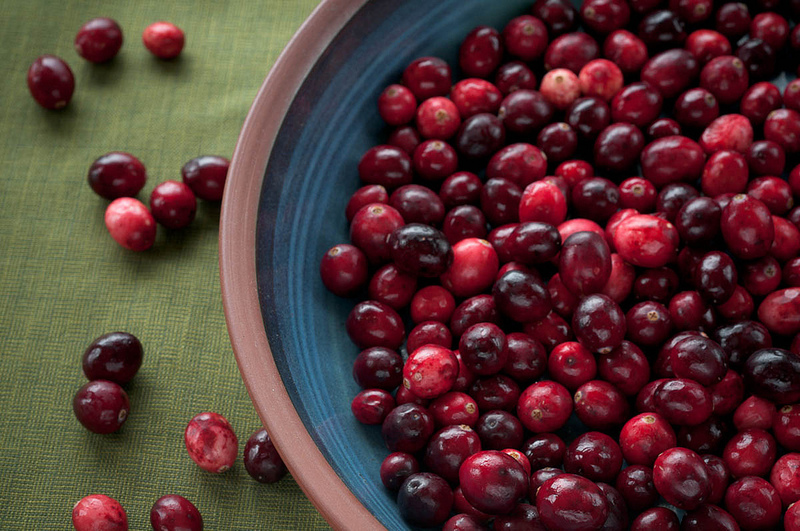 Have you ever used cranberries for a yeast infection? Did it help? Please share your comments and experiences in the comment section below. « How to Cure a Male Yeast Infection? I’m a big believer in the power of cranberries in general. 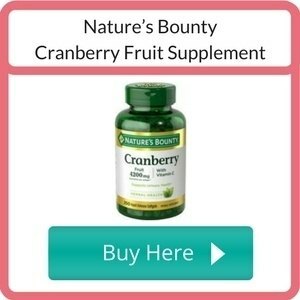 Specifically, I have a lot of confidence in Nature’s Bounty cranberry supplements to boost urinary tract health. I take Nature’s Bounty cranberry supplements for the high level of antioxidants and vitamin C. They’re affordable and convenient. I simply toss them in with my daily dose of vitamins and supplements that I take throughout the day. I also give Nature’s Bounty cranberry supplements to my cat who has a history of urinary problems. He easily swallows the small cranberry gel cap. He gets a treat afterwards and thinks it all the same good stuff. I think cranberry juice has a rich amount of antioxidants. I like to tell people that eating natural won’t prevent every disease in the world from hurting you but it will sure help you in the long run. Especially if you’re eating a wide variety of fruits as well as cranberries or cranberry extract. You’re right chris, it’s also very exciting that science is discovering new health benefits of natural remedies. Cranberries have always been used for urinary tract infection, but now their antifungal properties have been found, offering a whole new spectrum of possible uses. I will start by saying that yeast infection can be really annoying especially when it keeps on reoccurring.There are many remedies out there prescribed to help reduce its occurrence.However,it is the first time i am coming across how the use of cranberries can help cure this problem,thanks to your site.I have learnt new things for i did not know that men are also affected by yeast infection.I will keep coming back for more learning since you have such an informative site. Thanks for commenting fmwaniki, I’m happy to hear you learnt something new thanks to my articles. Please keep coming back! Cranberries are delicious and I personally don’t understand why people don’t eat more of them. I eat dried cranberries every day. I was wondering if I am missing any of the nutrients by eating them in this form. Are any of the nutrients lost in the drying process? I don’t know how I could find fresh cranberries where I live and the juices usually have so much sugar in them. Hi Michael, some vitamins, such as A and C, can be lost in the drying process, but it depends on how your cranberries get dried. The most effective way of drying fruit is freeze-drying. It results in fewer nutrient losses than using a conventional dehydrator, so it’s worth checking how your dried cranberries were dried. Yeast infections affect a lot of women, but most prefer not to talk about it and suffer in silence. I’m surprised that simple things like cranberry juice can help cure this silent suffering. I must admit it is the first time I’m reading about this, but not surprised, since l found your site some time ago, I’m always looking forward to your tips, l like that you are always looking for natural ways. Thank you for your comment Roamy. I don’t disapprove of antifungal medication, because in many cases they’re the only way to go when it comes to yeast infections. However, there are more and more Candida strains immune to antifungal drugs and scientists are working on finding new ways of treating yeast infections. Their main focus are plant extracts because in many cases they are as effective as antifungal drugs. So there are two benefits of using nature based treatments: you avoid contact with chemicals commonly found in traditional drugs and their potential side effects, and you get a powerful remedy against drug resistant Candida strains. Thanks for sharing this Kams. I know cranberry juice can help with a bladder infection but I never knew about candida. I’ll stock up on some for my daughter and hope that it helps her. I am enjoying all these natural remedies you are sharing, keep them coming! As mentioned in one of your other posts I am so tired of my daughter getting thrush. Last night again she was screaming with pain because I left my hubby watching her in the bath for a few minutes and she had convinced him to let her do her own hair with the shampoo. Needless to say she emptied the whole bottle in the bath… now we have a problem again. I really am at my wits end with this. Perhaps I should take her to a specialist and see if they can find out what is happening. I can’t handle seeing her struggle like this. Hi Lynne. I think taking your daughter to a specialist is the best way to go. The doctor will assess if it’s definitely a vaginal yeast infection and not a bacterial vaginosis or other issue. Sometimes medication may be the only solution, but it should be able to cure your daughter for good. I found an article about vaginitis in children, have a look. All the best! I really enjoyed this article about the effect of cranberry juice on yeast infections. The information was interesting and presented in an easy to read manner. There is always so much hype about different foods and drinks to cure this and that. I often wonder about the actual research. 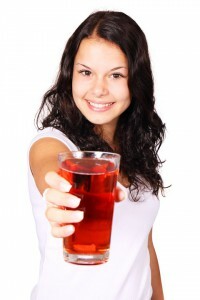 After reading this blog, I am considering adding cranberry juice to my diet. Does it need to be unsweetened? Does a product like Ocean Spray Cranberry Juice count? Hi Sheena, thanks for your feedback. According to their website Ocean Spray Cranberry Juice is pure cranberry juice, so it’s definitely a good choice. It’s always healthier to drink unsweetened juice. But although many people believe that eating sugar can cause vaginal yeast infections, my research suggests that it’s only the case when you’ve got impaired glucose tolerance. I have heard of Cranberries helping with a yeast infection, cranberry juice at least. I kind of thought it was an old wives tale, so this is interesting that it’s actually scientifically proven that it can help with yeast infections. That’s really interesting to know. There can’t be a woman out there who hasn’t suffered from one at least once in their lives, so keeping a stock in vitamin format at the back of the shelf seems like a really good idea! Thanks for your feedback:) Taking cranberry supplement can prove very effective, especially for those who suffer from recurring yeast infections. Another great option is propolis or aged garlic extract, both with antifungal and immunity boosting properties.